When you are digging a trench for a pipeline or for another construction project. Precision equipment is needed that can cut in precise dimensions without affecting existing utilities and other surrounding structures. 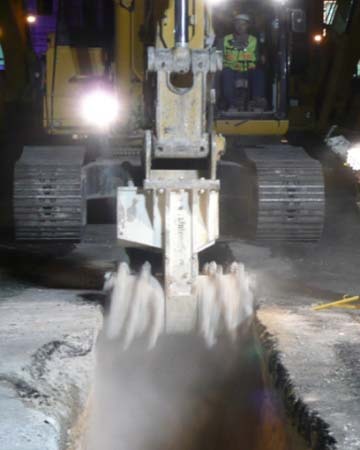 Alpine offers trenching equipment that can provide the heavy duty use and precision cutting that you require. Alpine cutter heads are excellent trenching equipment for most types of rock and concrete. These tools cut and grind up rock, soil, and concrete to produce the trench floor and walls. Alpine grinder and cutting heads have consistent dimensions to help you cut smooth trench walls with a flat trench bottom. Alpine cutter and grinder heads are fitted with carbide teeth. They are able to cut through even the toughest rock and concrete without breaking or wearing down. Our cutter and grinder heads provide powerful cutting force without sacrificing precision. Alpine also offers cutter buckets as three-in-one trenching equipment. Alpine cutter buckets combine a bucket with a hydraulic cutting tool to simultaneously cut, grind up, and remove debris from a trench. This tool is useful for the construction of trenches for pipelines and construction projects because of its multifunctional capabilities eliminate the need to change tools, saving time and money. Aside from trenching equipment, Alpine also offers other construction equipment such as roadheaders to drive the cutting or grinding process. Alpine provides project consulting services with the purchase of any roadheader. In addition, Alpine also handles soil mixing equipment, mining and tunneling equipment,concrete grinders, and cutter bits in all shapes and sizes. Whatever digging, tunneling, cutting, or grinding equipment you need for your construction projects, Alpine can supply it. Alpine prides itself on providing durable, precise construction equipment that will stand up to even the most difficult construction project or rugged terrain. The Alpine name is synonymous with quality, commitment to detail, and precise engineering. We are happy to consult with you about creating custom solutions for your project, or to advise you about which off the shelf projects are most appropriate for your needs. We are committed to your satisfaction.